Discussion in 'Reviews and Tests' started by BC2Tweak, Aug 31, 2016. 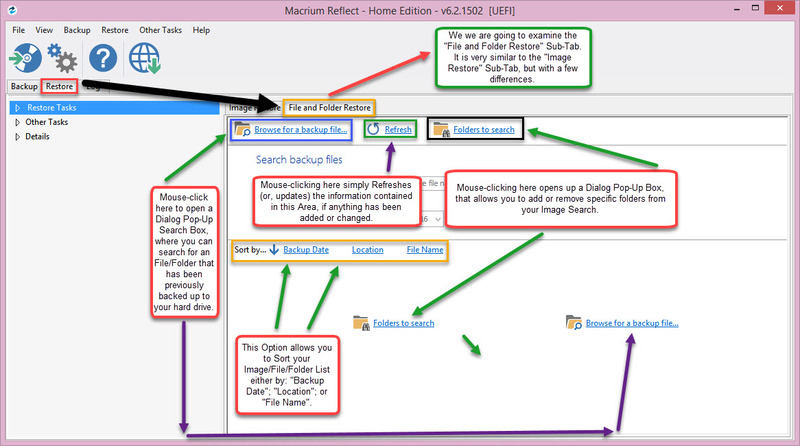 -- This Review deals specifically with the "Home Edition" of Macrium Reflect. -- The only difference between the "Home Edition" and the "Workstation Edition" is the Support Options. 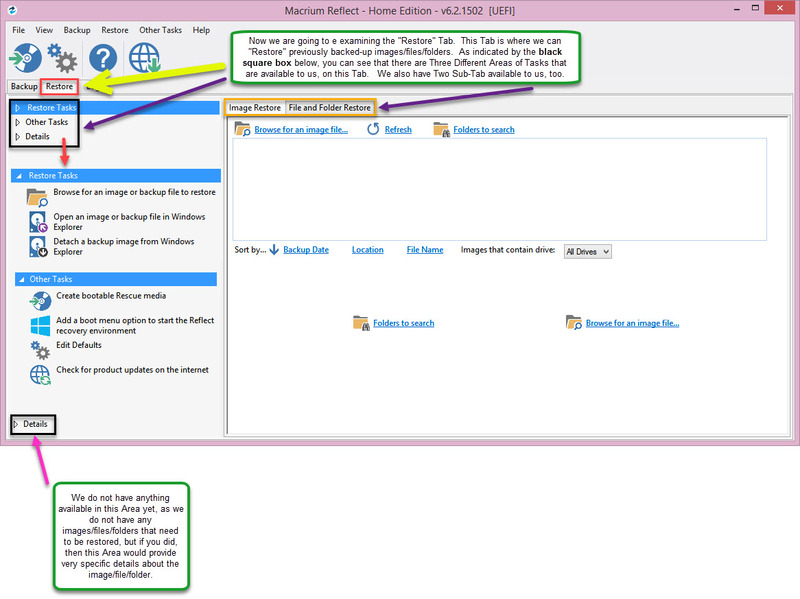 The "Home Edition" has the following Support Options: Tech Support via Email; Access To Macrium Support Forum; Access To Technical Support Knowledge Base. The Workstation Edition has the follow Support Options: Standard Support, which includes the Options with the "Home Edition", plus--Free Maintenance Upgrades to New Versions; Remote Access Support. Both Editions Support Options are good for a 1-Year Period. * Here is what the "MPI" looks like. If the program detects that you have not created any "Rescue Media" using itself, then you will be prompted with this Dialog Pop-Up Box that will be shown in the following screenshot. * Now, we shall examine the "Menu". The following screenshot shows all the Options that are are available on each separate Menu. -- The "File Menu" has only One Option, and that is "Exit", which will close the Program and return you to your Windows Desktop. -- The "View Menu" has Two Options. And they are: "Toolbar", which Activates or De-Activates the Toolbar (as shown in the screenshot above). You mouse-click on the little square box to Activate/De-Activate the Toolbar. The next Option is: "Refresh", which will "Refresh (or, Reload)" the "MPI". - (1) "Image Selected Disks" (which will create an Exact Image of all the Drives you have selected on the "MPI"). You must have the available Drive Space to do this, because it will make an exact copy of the Drives you have selected, otherwise this Operation will fail. 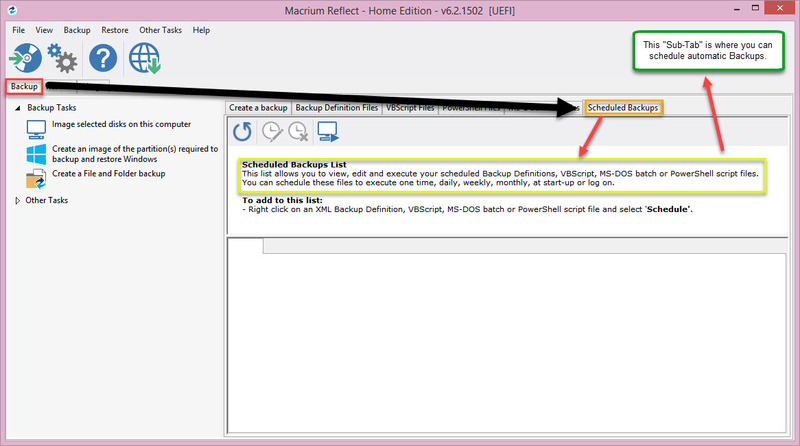 - (2) "Backup Windows", which will backup up all your Windows Files to another area. - (3) "Backup File", which will backup all of the Files/Folders that you have selected to be included in the backup. 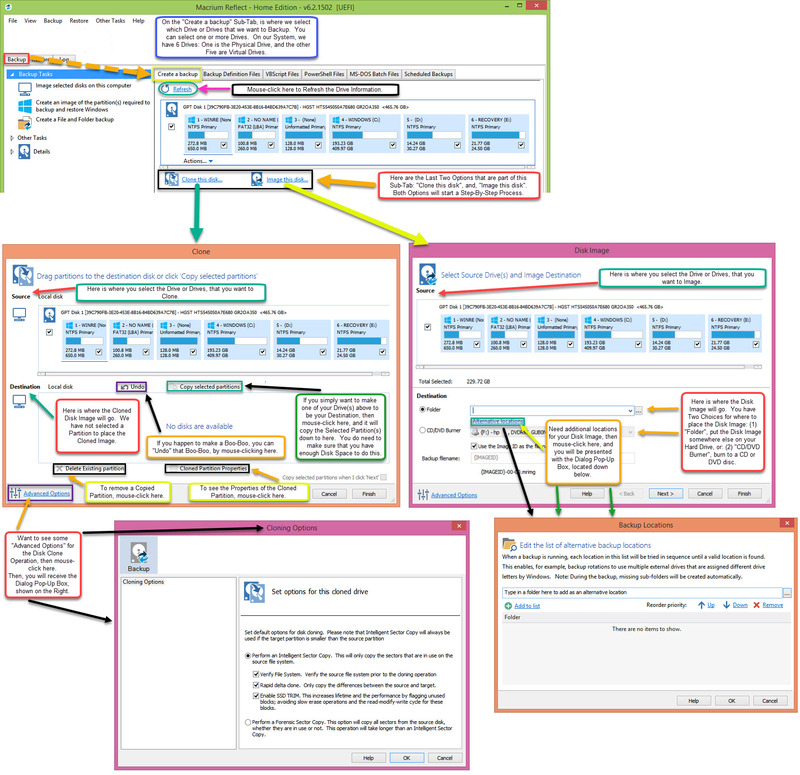 - (4) "Backup Templates", which will open the "Backup Plan Templates" Dialog Pop-Up Box. 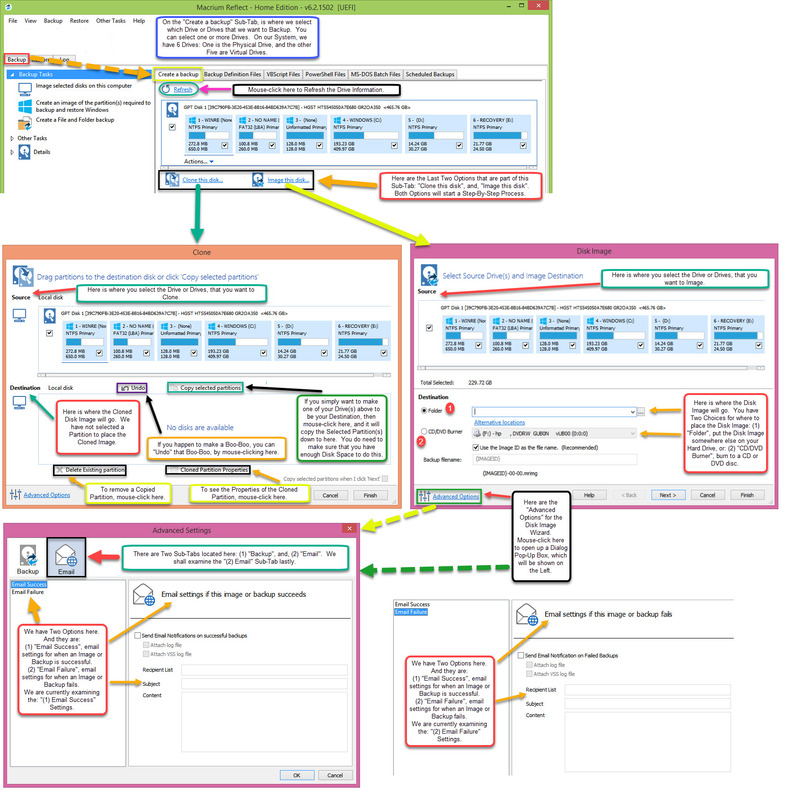 This Dialog Pop-Up Box will allow you to create/manage any "Backup Plan Templates" that you have previously created, as well as, allow you to create/manage new "Backup Plan Templates". - (1) "Browse for an image or backup file to restore", which allows you to Search your Computer System for a Backup Image or Backup File to restore. - (2) "Explore Image", which allows you to "Mount (or, Attach)" an Image, so that you can work with this file. - (3) "Detach Image", which allows you to "Unmount (or, Detach)" a Temporary Mounted Drive. 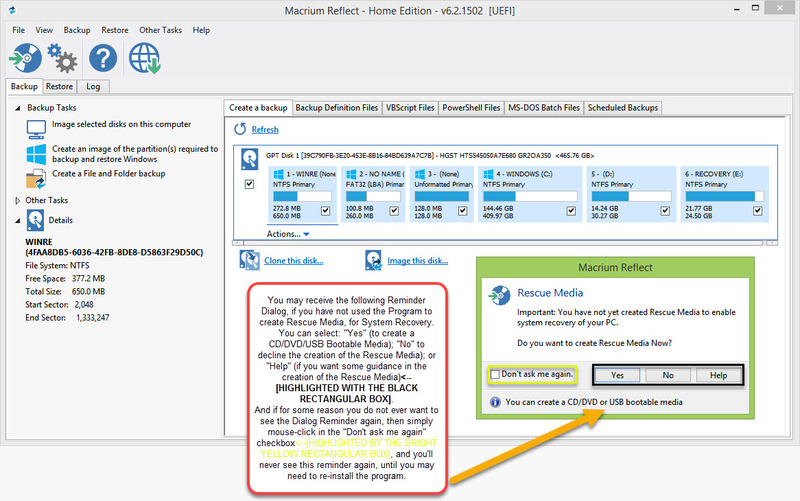 - (1) "Create Rescue Media", which allows you to Create Rescue Media using the Macrium Reflect Program. This is a very HIGHLY RECOMMENDED IDEA, in case, you ever need to re-install your Computer System. We had an issue with Windows 8.1 and having this Macrium Rescue Media was a godsend, because it allowed us to get into our laptop and re-install Windows. This is not the same as Windows System Recovery or a manufactuer System Recovery. 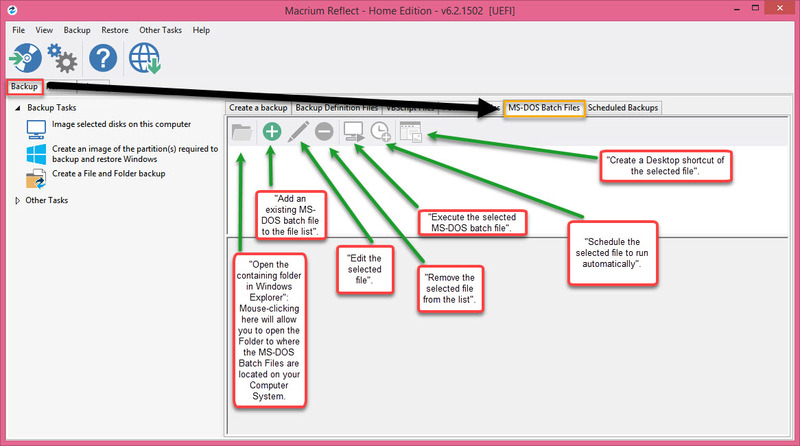 Macrium Reflect installs its own method, using the WindowsPE software. - (2) "Add a Recovery Boot Menu Option", which allows you to install a start-up Boot Option into your System, that will allow the Reflect Recovery Operation to start, in the case of a System Failure. - (3) "Edit defaults", which allows you to edit any and/or all of the Default Reflect Settings. - (4) "Check for updates", which connects to Macrium servers to see if there is an update available for the Program. You MUST HAVE AN ACTIVE INTERNET CONNECTION for this to work. - (5) "Convert image to VHD", which allows you to convert a previously made Image to a VHD (or, Virtual Hard Drive). 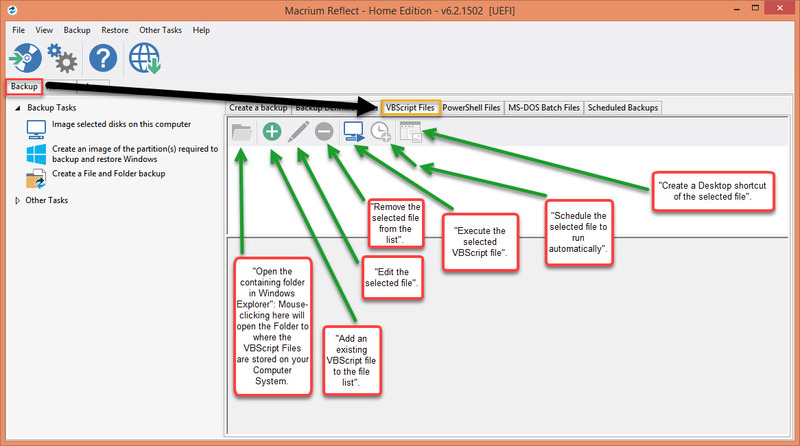 - (6) "View Windows VSS Events", Macrium uses Volume Shadow Copy Service (VSS) to create its images and backups and Windows keeps a log of VSS events. 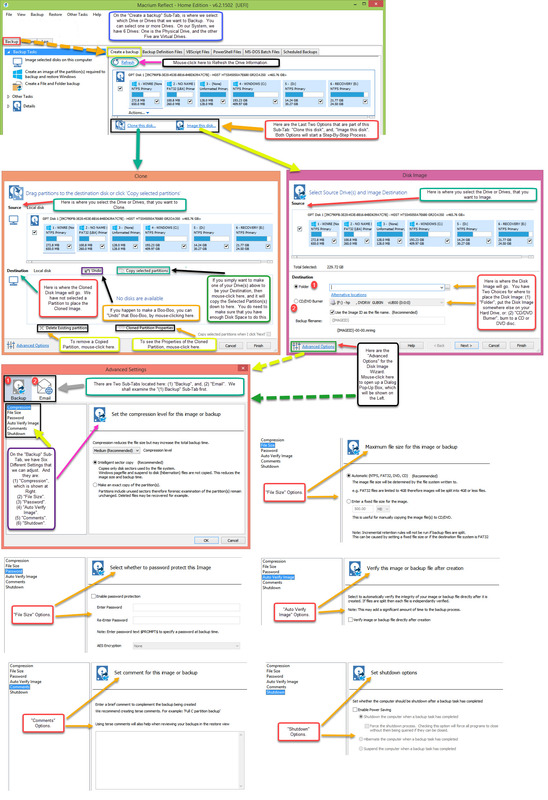 These events can give you information, useful if you are experiencing problems, such as backup failures. - (7) "Fix VSS Problems", which allows you to be able to fix Volume Shadow Copy Service (or, VSS) problems,if you are experiencing backup failures, et cetera. - (1) "Help", which provides Help Articles relating to all of the functionality of the Program. - (2) "Release Notes", which provides information about what has been: added; removed; fixed--in the various Releases of the Program. Usually this starts with the Current Release of the Program, and then goes down. - (3) "Configure Update Check", which opens up the Live Update Settings Dialog Pop-Up Box, and allows you to set the Live Update Settings to your specification. - (4) "Update license key", which allows you to install a new license key, in the case your current one has expired or you have upgraded to a higher version of the Program. Normally, you do not need to mess with this Setting. - (5) "Remove license", which allows you to Remove the Macrium Reflect license off your current Computer System, so that you can re-use the License, in the case you have to do a system restore and software re-installation. You should not mess with this setting unless absolutely necessary. 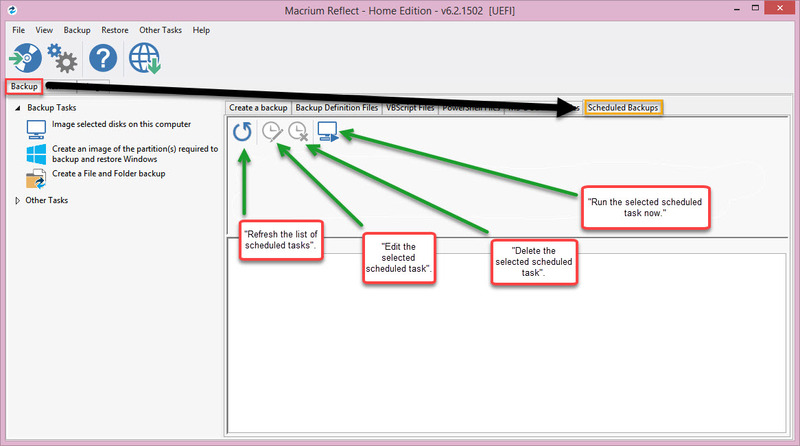 - (6) "About Macrium Reflect", which provides statistical information about the Program, such as: name of the Program; version number you are using; your License Information; and other such data. -- Here's an explanation of the Toolbar, as described in the screenshot above. 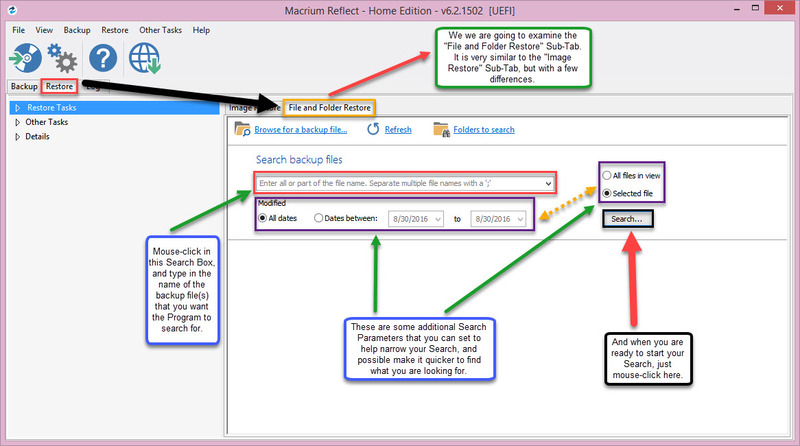 As you can see below, the Toolbar provides Quick Access to Four of the Commonly Used Functions within "Macrium Reflect". * Now, let's examine some of the other parts of the "MPI". 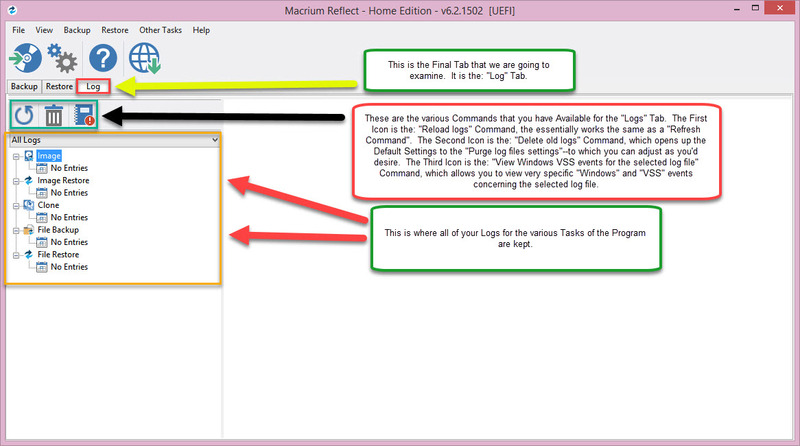 -- First of all, you can see the Version, of Macrium Reflect, that we are using: "Home Edition - v6.2.1502". We are also pointing out that we have Three Tabs on the "MPI", which we are calling, "Quick Tabs", because they contain quite a few of the Functions of the Menu System, and are more readily avaiable, than having to mouse-click on the Menu itself. The First Quick Tab that we are examining is the: "Backup" Quick Tab. 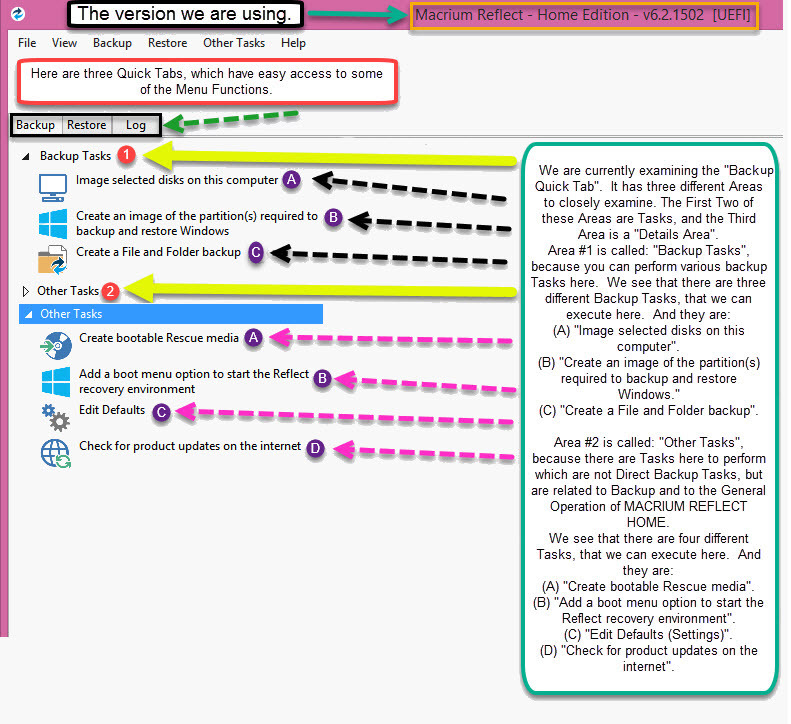 On this "Backup" Quick Tab, we will look at Two of the Task Areas: (1) "Backup Tasks", and, (2) "Other Tasks". ....(A) "Image selected disks on this computer", which allows you to create a Image of all the Hard Drives that you have selected on the "MPI". These can be either the Physical Drive, or any Virtual Drives. 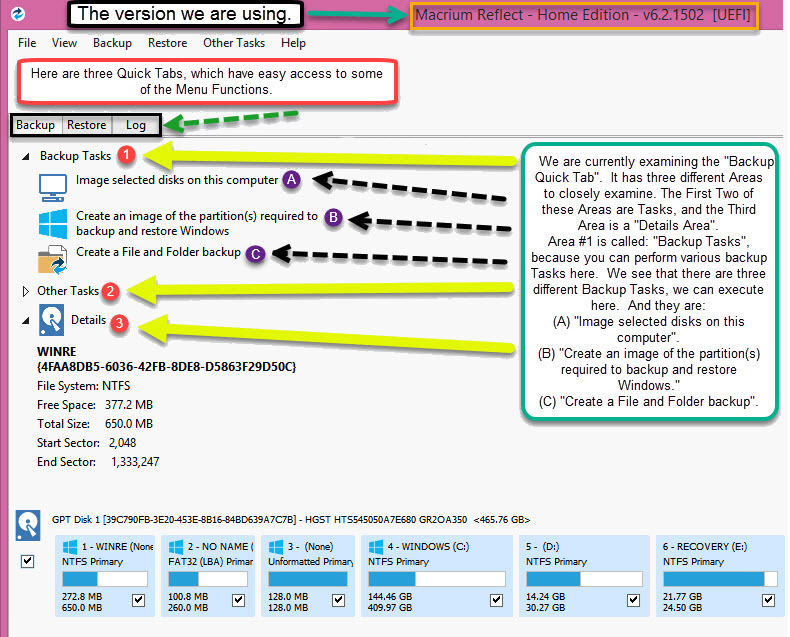 ....(B) "Create an image of the partition(s) required to backup and restore Windows", this Option is better explained using this portion of the "Macrium Reflect v6 User's Guide": http://knowledgebase.macrium.com/display/KNOW/Windows+Partitions. ....(C) "Create a File and Folder backup", which allows you to select "Files" and "Folders" to be backed up. ....(A) "Create bootable Rescue media", which allows you to Create a Reflect Bootable Recovery Disk. Again, this is very different from a Manufacturer-generated Recovery Disk or a Windows-generated Recovery Disk. This Rescue Disk uses the WindowsPE system for booting and Recovery. However, it does not install WindowsPE onto your hard drive, but rather allows you to be able to boot into your system and perform a System Restore, System Recovery, et cetera. ....(B) "Add a boot menu option to start the Reflect recovery environment", which allows you to add an Option to the Boot Menu to use the Reflect Recovery Environment, instead of the Default Windows Recovery Environment. This is very helpful, if for some reason you cannot boot into the Windows Recovery Environment. ....(C) "Edit Defaults", which allows you to Edit the Default Reflect Settings. ....(D) "Check for product updates on the internet", which connects to Macrium servers to see if there is an update available for the Program. You MUST HAVE AN ACTIVE INTERNET CONNECTION for this to work. ...."File System", what file system your OS is using. In our case, it is the "NTFS" File System. ...."Free Space", how many available Drive Space is left. ...."Total Size", the actual Total Size of the Drive. Virtual Hard Drives will be less than the actual Physical Drive. ...."Start Sector", where the Drive starts. Virtual Hard Drives will be less than the actual Physical Drive. ...."End Sector", where the Drive ends. Virtual Hard Drives will be less than the actual Physical Drive. -- Here's a further explanation of the Functions listed under the "Other Tasks" Area. -- Here's a further explanation of Area #3 ("The Details Area"). -- Here we see the Available Options (or, Sub-Tabs) we have while we are using the "Backup Tab". -- Here's a detailed explanation of the "First Sub-Tab: Create a backup". 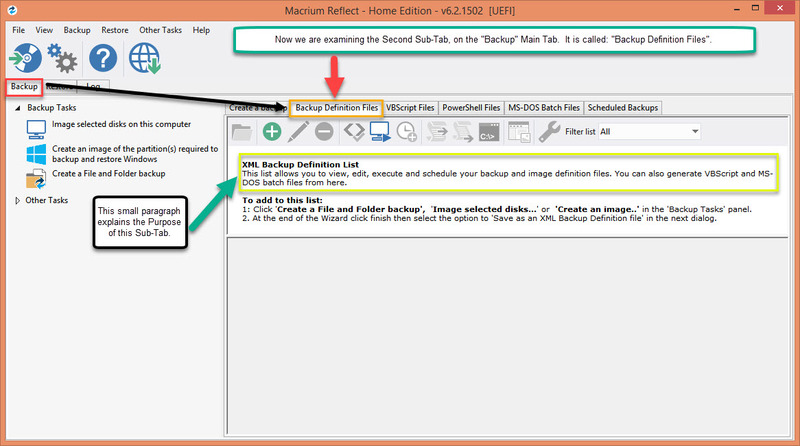 -- Here's a detailed explanation of the "Second Sub-Tab: Backup Definition Files". 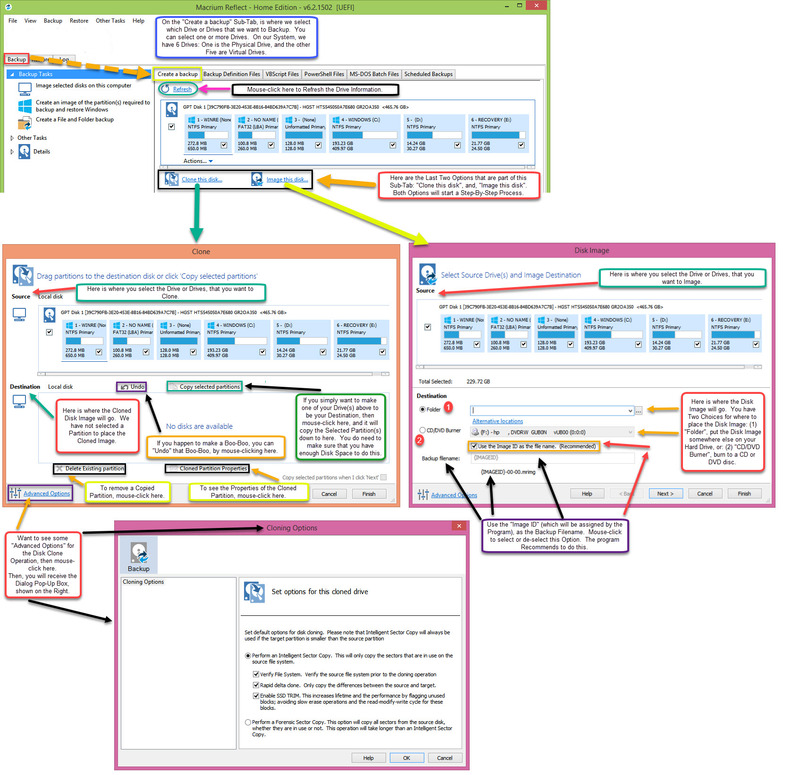 -- Here's a detailed explanation of the "Third Sub-Tab: VBScript Files". 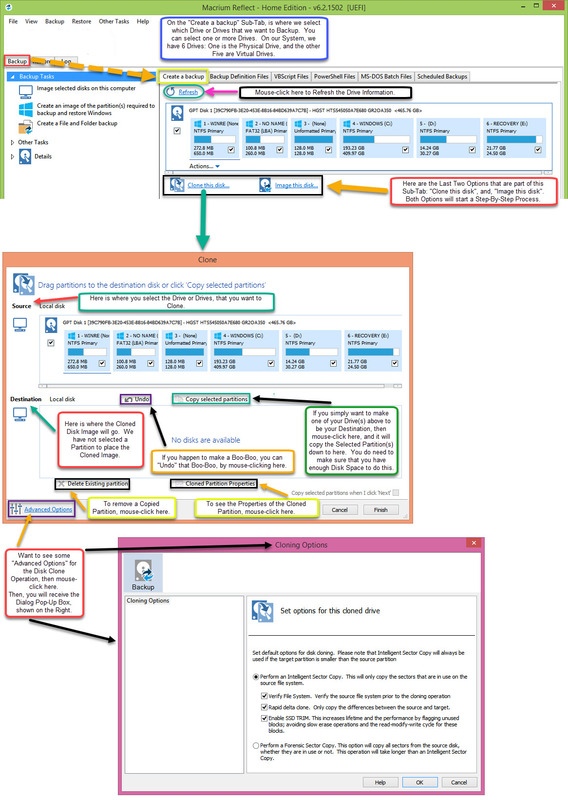 -- Here's a detailed explanation of the "Fourth Sub-Tab: PowerShell Files". -- Here's a detailed explanation of the "Fifth Sub-Tab: MS-DOS Batch Files". 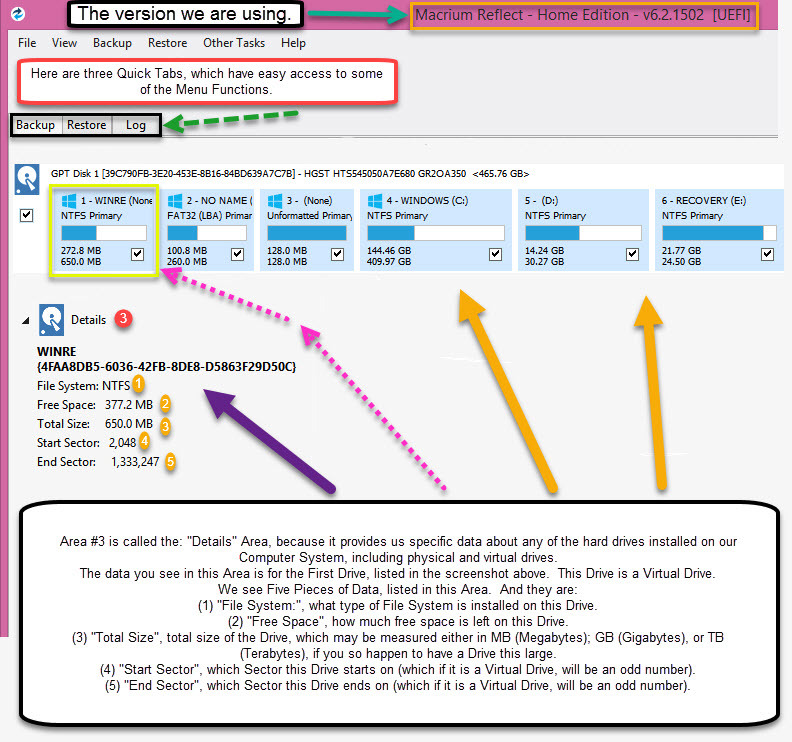 -- Here's a detailed explanation of the "Sixth Sub-Tab: Scheduled Backups". -- Secondly, we are also pointing out that we have Three Tabs on the "MPI", which we are calling, "Quick Tabs", because they contain quite a few of the Functions of the Menu System, and are more readily available, than having to mouse-click on the Menu itself. 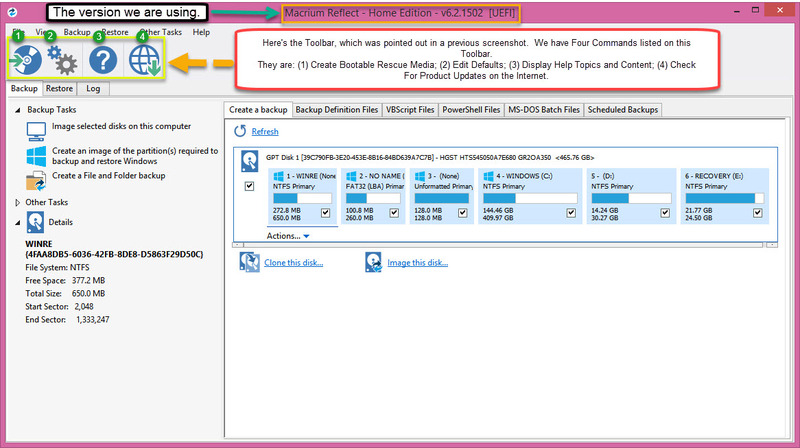 The Second Quick Tab that we are examining is the: "Restore" Quick Tab. On this "Restore" Quick Tab, we have Three Task Areas: (1) "Restore Tasks", (2) "Other Tasks", and, (3) "Details" (This Task Area is empty because we did not have any "Restore" Tasks done whilst we were conducting this Review). We also have Two Sub-Tabs on the "Restore Tab", and they are: (1) "Image Restore", and, (2) "File and Folder Restore". 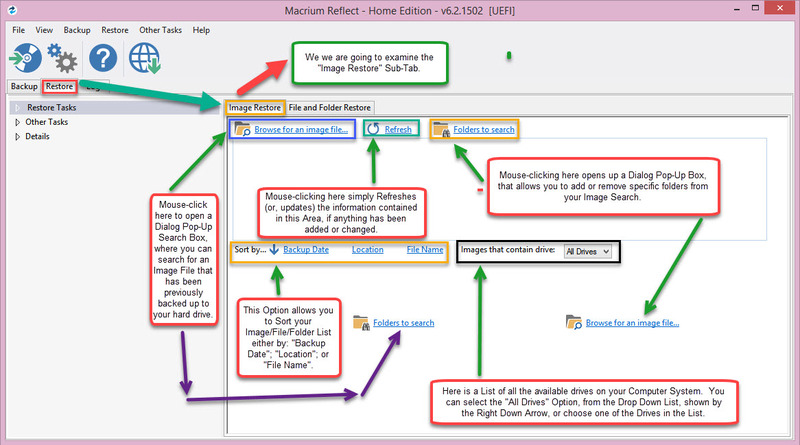 - Here's a detailed explanation of the "Image Restore" Sub-Tab. 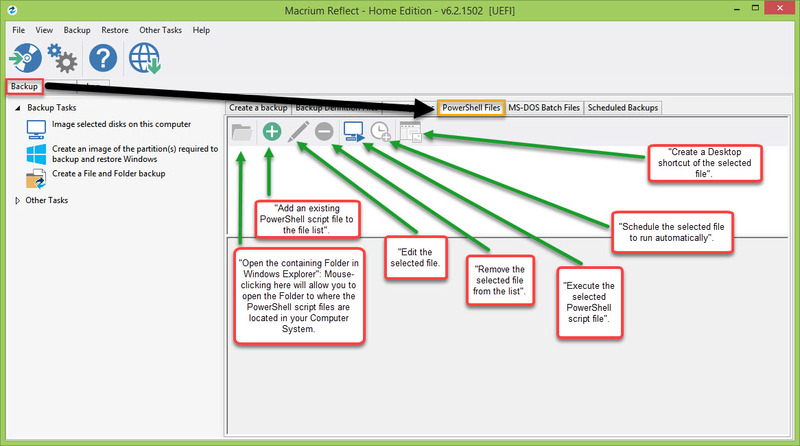 - Here's a detailed explanation of the "File and Folder Restore" Sub-Tab. -- Thirdly and Lastly, we are also pointing out that we have Three Tabs on the "MPI", which we are calling, "Quick Tabs", because they contain quite a few of the Functions of the Menu System, and are more readily available, than having to mouse-click on the Menu itself. The Third Quick Tab that we are examining is the: "Log" Quick Tab. On this "Log" Quick Tab, we have only One Task Area: (1) "All Logs" (which contains all the Logs generated by all the Functions of the Program that generate logs). We also have a Mini-Toolbar on this "Log Quick Tab". This Mini-Toolbar contains Three Commands: (1) "Reload logs" Command (Icon looks like a full-circle arrow pointing left). This Command does basically the same thing as the "Refresh Command". (2) "Delete old logs" Command (Icon looks like a trash can). This Command opens up the "Purge log files settings" Dialog Pop-Up Box, to where you can adjust this Settings to whatever you'd like. (3) "View Windows VSS events for the selected log file" Command (Icon looks like a spiral-bound notebook with a red/white exclamation mark on it). This Command allows you to view specific details concerning any VSS (Windows Volume Shadow Copy Service) events related to the selected log file. These VSS events could include any backups that have failed to complete properly or any other VSS System Issues. VSS is a Microsoft Windows software technology. LowcyGier, wwd, jasonX and 9 others like this. LowcyGier, wwd, jasonX and 5 others like this. LowcyGier, wwd, dinosaur07 and 3 others like this. LowcyGier, wwd, Der.Reisende and 3 others like this. Awesome review as usual @BC2Tweak!! I am using the free edition, a great piece of software that has saved my testing pc in many situations. It is regularly updated and it is possible to create a full OS image in about 10 minutes. LowcyGier, wwd, Der.Reisende and 1 other person like this. LowcyGier, wwd, Der.Reisende and 2 others like this. LowcyGier, wwd and Der.Reisende like this. LowcyGier, wwd, Der.Reisende and 4 others like this. Fab thank you! This looks great, will get it tweeted as well. LowcyGier, wwd, Der.Reisende and 6 others like this. Clear and detailed illustrations on the application. Hope there will be giveaway of this software sometime later here and If Lifetime Licenses could be given too are much appreciated! LowcyGier, wwd, revC0de and 2 others like this. LowcyGier, wwd, Der.Reisende and 5 others like this. Excellent and thorough, BC2Tweak is extremely talented at this job as the review is very complete and explained in every detail. Hats down, dude. LowcyGier, wwd, guardian and 2 others like this. I would say, your are a great reviewer, i appreciate your work and really you deserve it, very hard work very good. LowcyGier, wwd, guardian and 1 other person like this. I think that's why I really love cats, because they are so unpredictable, and are very entertaining to watch...and enjoy!! LowcyGier, wwd, RGiskardR and 1 other person like this. LowcyGier, wwd and RGiskardR like this.